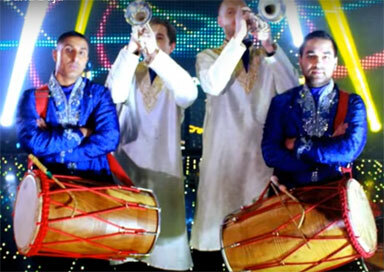 This Birmingham Baja Band are available for your Baraat and will create a fantastic lively and colourful atmosphere for your entrance. The band combines traditional Punjabi Bhangra and Indian film music with the distinctive sound of various English brass instruments to create a fabulous melodic fusion. This provides an unforgettable and highly energetic east meets west performance, which is great for any type of event. Brass instruments such as trumpets, french horns, tubas, saxophones or trombones are fused with the explosive sound of the dhol and or other percussion instruments. Our bands versatility allows them to play almost any hit in this East/West fusion style from popular Bhangra, Bollywood or Western classics.